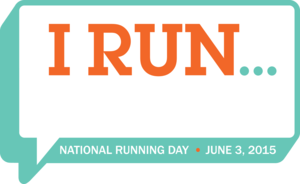 Today is National Running Day. I want to celebrate together with you. It’s held each year on the first Wednesday in June, when runners everywhere declare their passion for running. My goal is to walk/jog at least one 5K this year, hopefully more. Several years ago, I walked my first 5K’s and would love to do it again! In January this year I radically changed my lifestyle, eating healthier, exercising, and drinking water instead of Coke. Weather permitting, I walk daily at the track in town, and recently our daughter Leah joined me. The Bible says that God’s mercy is new every morning. Jesus died for your sins and if you have a relationship with Him as your savior, His forgiveness is complete. Are you running from a relationship with your spouse, a child, a friend, or someone at work? Pray and ask God to help you love that person with His love and for His grace in dealing with him or her. You may not have the answer for how to resolve the problem, but God does. 2. Who or what are you running to? God? Are you running to your spouse-or someone who is not your spouse when you’re hurting? (which is dangerous) Your child? A friend? Sometimes we may go to a friend talking about all our problems, when instead we need to go to God or our spouse. Are you running to drugs or alcohol? Food? Shopping? Money/wealth as your god? God is the only one who can fill up that black hole inside of you. 3. What are you running for? What is your purpose? When I began exercising in January 2015, it was for one purpose: for fitness and health. I can’t fulfill the purpose for which God created me (speaking, writing books, traveling/missions) if I don’t feel well or if I become sick. Losing weight was a side benefit to my new routine. I now have an additional goal, which is to reach my idea weight (I have 20 pounds to go!). I want to run this race of life well so that when I meet God face to face, I will hear from Him, “Well done thou good and faithful servant.” (Matthew 25:23) I want to accomplish the purpose for which God made me. What about you? 4. When will you start running? When will you do what God has called you to do? It’s time! Even though I knew I needed to eat healthy, drink water, and exercise regularly, I had so many excuses for why I didn’t. My extra weight was “baby fat.” Our daughter Leah is 20 years old now, so that was no longer an excuse! I was “too tired” to exercise. Now that I eat healthy, drink water, and exercise, I have much more energy! What hindrances or obstacles are keeping you from your purpose and calling? For years, I was too scared to speak in front of people. God had to drag me into it, and now I LOVE it, especially speaking at live events (if you are an event planner or know someone who needs a speaker, contact me here!). I had never written a book before, but that didn’t stop me. I’ve now written eight books and am writing three more. The one I’m working on now is my first fiction book. Maybe God has told you to write a book, too. Now is the time; this is the year! What are your excuses? What hindrances or obstacles are in the way of your personal and business success? As Nike says, just do it! When I started walking/jogging in January this year, my reason was for fitness/health. A side (wonderful) benefit was losing weight. Now I’ve set a new goal, to lose 20 more pounds to reach my ideal weight, and to walk/jog at least one 5K this year. It’s important to have dreams and goals in your life and to achieve them. My motto is, “Dream big because we serve a big God.” More than anything, my desire is to do God’s will. That’s why I want to run in this race of life, too–to feel God’s pleasure. To glorify Jesus Christ. Are you feeling God’s pleasure in what you’re doing right now? You can start today. 6. How are you running? Are you a tortoise or a hare? Are you running slow, lagging behind God–procrastinating, putting things off, blaming, being a perfectionist? Procrastination and perfectionism will trip you up and will keep you from fulfilling your purpose. Or maybe like me, you’re like a racehorse, rarin’ to get out of the starting gate. You were BORN TO RUN FAST, like Secretariat the race horse. You are serious about the calling of God on your life and you know you have no time to waste. But sometimes, you run out ahead of God! We have to make sure that we’re in sync with God, flowing in rhythm with His heartbeat, as my friend Doreen Penner says. When you first start walking or running, you have to pace yourself, not going too slow or too fast. You have to listen to your body. It will give you signals. God does this, too. He speaks to you in His still, small voice. In prayer. Through His eternal word. From a spouse, child, or friend. Little nudges and whispers. Dreams. Signs. Confirmations. Learn to listen carefully and obey God’s still, small voice and you’ll experience His blessings. 7. Finally, to walk and run, you need the right equipment. When I first started walking this year, I started out just with what I already had: t-shirts, yoga pants, and my aerobic shoes that I’d bought for walking and for our daughter Heather’s Zumba class. My goal is to buy some really good running shoes to walk/jog at least one 5K this year. A good pair starts at about $75 and up. The best stores help you with fitting, including watching you walk/jog. I did buy some walking/running clothes earlier this year–a black, short sleeved walking shirt and some black running pants that are a little “stretchy” and very comfortable (both light weight, so I won’t get too hot). Changing into this outfit and my walking/running shoes gets me into the “mindset” of discipline for walking/jogging. You don’t want to be uncomfortable while walking/running, and I highly recommend getting some good walking/running shoes. You can’t walk or run in boots or stilettos! Cinderella’s slipper, no one else can walk in your unique purpose. Today, let’s celebrate National Running Day together. Use the hashtag #nationalrunningday on Twitter and social media. Get out there and walk, jog or run. (Or if you don’t enjoy that, swim, ride a bike, skate, dance, or do an exercise video). You can download an app to track your miles to contribute to the charity you want. There’s resources and deals at the website, National Running Day. Let’s also run this race of life well, reaching for the high prize of Jesus Christ. No more holding back. God and I are cheering you onto the finish line. You can do it! I created a video blog (called a vlog) covering the same tips in this blog post with my web cam today. You can view it by clicking here. ← Do you need a reset button?